Although the first official Grand National is quoted as 1839 it is now widely accepted that thee were races before this date which should be classed as Grand Nationals. There are three years to be added 1836/37/38 however the story starts much earlier than this. For our purposes the story starts in the 1820's but it should be remembered that there had been race meetings in Liverpool back as early as 1576. Meetings were held here on Ascension Day for many years and the trophy raced for then was a silver bell. Racing however soon became lost to Liverpool and much later in the mid 1700' racing was reintroduced but again through lack of support racing was terminated around 1786. We have to move on now until 1827 when a local land owner John Formby started holding races at Maghull. This was a success and one of the people involved in the project and local innkeeper by the name of William Lynn, who also sponsored hare-coursing events, decided that he would like more involvement in the horse racing and he leased some land at Aintree from Lord Sefton. Mr. Lynn a good businessman and entrepreneur put money into the project and build a grandstand for the racing and such was his enthusiasm for the project that the first race was held on 7th July 1829, a flat meeting then of course. Lyn held three meetings a year and soon began to experiment with hurdle races at the course. All the racing was well liked. 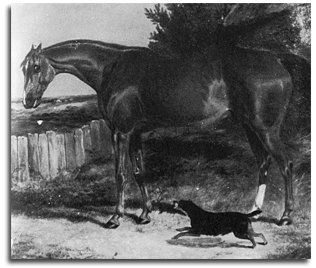 Mr. Lynn expanded the mount of hurdling races held and in 1835 he set aside a whole race meeting for the hurdle races. Again these were a great success and not to be one to stand on his laurels Mr. Lynn soon got the idea of holding a steeplechase much like The Great St. Albans steeplechase that proving so popular. A sweepstakes of 10 sovs. Each with 80 sovs. Added, for horses of all denomination, 12 st. each, Gentlemen riders, second horse receives stake back. Winner to be sold for 200 sovs. If demanded. The race was an incredible success, a local journal wrote of "immense crowds many of whom has brought their own telescopes" proving that they were there to watch the race and not simply there for the event. ridden by the famous Captain Becher and owned by Mr. Sirdefield. This race is often referred to as The preliminary race by those who believe that the first race was the 1827 race, however it may have just been the case that the naming of the race was clearer the following year when it was named as The Grand Liverpool Steeplechase. but actually the race was still not called The Grand National until 1847 when the name was changed to The Grand National handicap steeplechase.